A common variant of the Acclamator, the Carrier played a pivotal role in the attack on the Intergalactic Banking Clan's headquarters at Muunilinst. 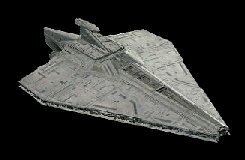 Capable of carrying eight flights of fighters as well as still bringing thirty LAAT/i gunships for ground assault, the Carrier is a particularly deadly combatant. With optimization of the hangar bay, the Acclamator Carrier had an increased launch and recovery capacity that proved to be of great import during raids against the CIS fortress worlds on the Rim. The Carrier variant failed to overcome the initial design flaws of the Quad TLs, and still had reduced fire control and a six turn delay between combat and bombardment mode.